Sifu David A Ross began training martial arts in large part to regain his health after having been diagnosed with Leukemia at the age of six. At the time of his diagnosis, half the children did not survive and many of those who did survive still had long term health problems. These experiences explain not only his personal dedication to the martial arts but also his lifelong career sharing their benefits. 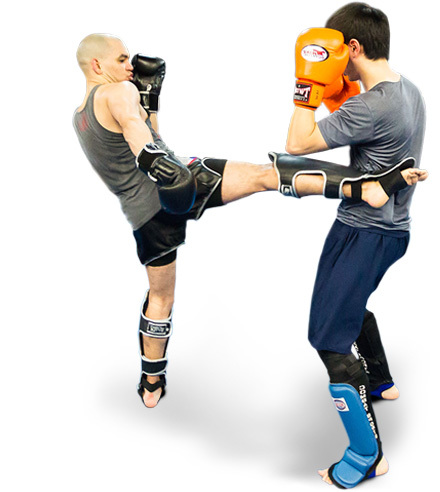 Fitness Kickboxing is designed to take the best benefits of Muay Thai and Mixed Martial Arts (MMA) training and offers them in a safe, non-competitive and entertaining format appropriate for all. We have men and women of all ages and all levels of physical condition in our classes. Muay Thai and San Da offers a unique, modern way to learn martial arts. Both men and women can learn the powerful kicks, punches, knees and elbows that make this training both effective total body fitness and self-defense. We offer training from beginner to professional athlete. I started taking Kickboxing classes right after my 43rd birthday in February 2016. Nearly one year later, I can say I have never felt stronger. As a lifelong fitness enthusiast and certified personal trainer, I know how challenging it can be to find a program that offers full-body conditioningthat doesn’t get “old” . 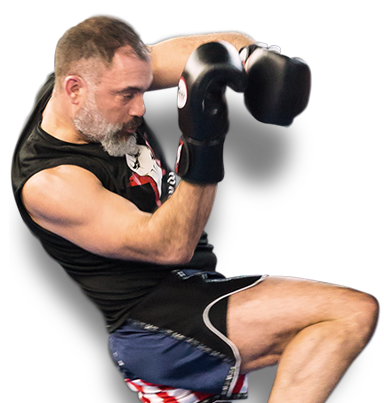 Every class features different warm-up exercises and combinations at the heavy bag. That means no two hours are ever the same and I finish every class feeling fierce and ready to take on whatever New York City throws at me. If you’e looking for a no-frills workout to gain strength - physically and mentally - it's right here. I've been at NY San Da for 8 years now. My goal when I started was to just lose weight, I’ve accomplished that (25 pounds) and gained a “gym” family 8 years later. (along with a few bicep cuts) Nothing was working, my mind wasn’t in it and I had never “stuck” with any gym routine in my life to actually see results. I loved it from the first class and signed up immediately. Not only are you burning calories and getting healthy, but you are having FUN. Classes are always different; instructors and owner are knowledgeable and care! David, the owner is professional and takes care of his members. It’s safe to say I’ll be sticking with this for a while! A no-frills gym, NY San Da is a great value for the price of classes. The draw of this location is without a doubt the instructors...a varied workout plan and varied instructors from class to class keep you constantly discovering new exercises (and muscles)! I have been attending the location for one year now and it has become an integral part of my fitness routine....as someone that had never practiced kickboxing before I found a welcoming environment that allowed me to develop my skills and instructors that will constantly help you improve your technique. Definitely recommend it for anyone male or female regardless of age or technique who is looking for a fun and effective way to exercise! I am currently in the best shape of my life thanks to the staff here. Each class is always different so you never know what to expect. The instructors are there to give us the movements of the drills but it's all up to us on how we want the intensity. It's helped me a lot 'cause I've learned to know my own limitations and how far I can push myself. And coming to each class I always feel like I've improved upon the previous classes and feel ready for the next challenge. Ny San Da is the place to be. If you want a great workout with best Instructors in the world... Here it is !! Before going to Ny San Da, I was 230 lbs, and now im about 204 and lossing. Running after a 5yr old isn’t easy! Now he is telling me to slow down. Joining NY San Da was the best choice I have ever made. I am in the best shape of my life. I have lost 40 pounds in the last year and a half. I have replaced flab with muscles that you can actually see. I am also more confident knowing that I can defend myself better than I could before, if need be. Thank you! First off, I am a personal trainer so I have worked in and around gyms for over 20 years. I was always looking for the next level of workouts and early on that was just weightlifting to “get big.” As a more mature trainer, I was recovering from shoulder surgery and I began looking for a place to do more functional training. I came across NY San Da on line and decided to try it out. Right away I liked the energy in the place. Not competitive and very helpful. Once I started taking classes I was hooked. This is a challenging workout for me and I am in shape! Don’t let that scare you off, there are people of all shapes and sizes, of all ability levels and each person works out hard. I've been a member for three years and have stuck with it this long because I've finally found a fitness routine I actually look forward to and love doing every day. Since starting I've lost about twenty pounds, but the most important thing is that at 50, I am in the best physical shape of my life and more confident about my body and the things I can do with it. The classes haven't gotten boring or dry yet. The instructors are patient, skilled and motivational; the routines are high-energy and adrenaline-pumping, and the location and schedule are convenient enough to fit most students' needs. Best bang for my bucks! I can't say enough good things about this gym.